I first learned of The Culinary School of the Rockies when my old work group was looking to book a fun team-building event. We ended up doing something else, but I held on to the brochure. 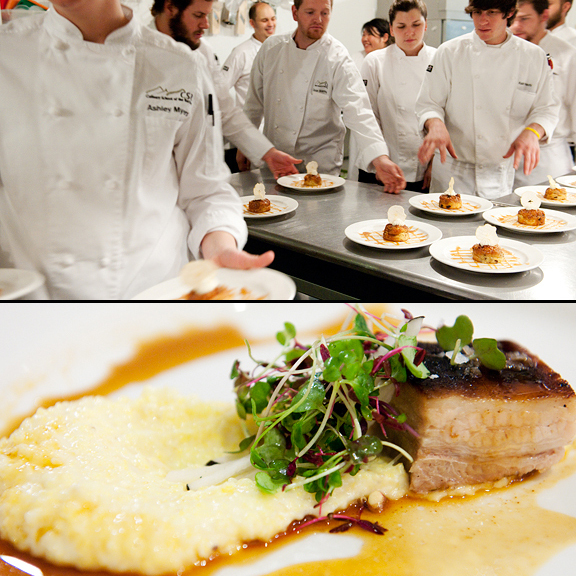 Not only does CSR offer corporate classes, they also have home cook classes and professional culinary programs. 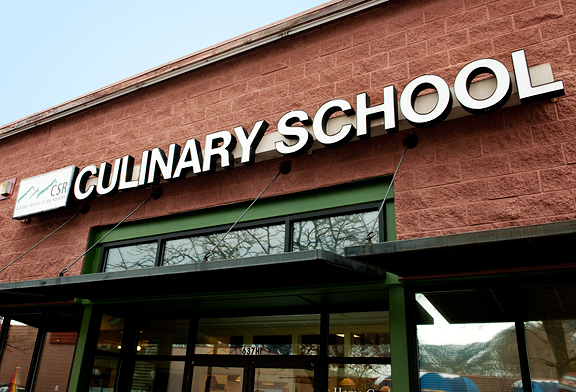 I was so excited to know that we had a culinary school here in little old Boulder. I enrolled in their 10-week pastry skills class – probably one of the best classes I’ve ever taken. It must be said that this blog owes a good deal to CSR for the quality of the pastries and sweets you see. Our class was fast-paced and chocked full of great information, techniques, recipes, and especially tips on high-elevation adjustments. Even though we worked at a frenetic pace from the moment we donned our aprons, Chef Shan made it a fun 5-hour class each week. Pastry skills gave me the confidence to tackle new recipes after the ten weeks were over. The fundamentals I had learned continue to carry my baking and candy-making to this day. My MIL is a baker too. Every time my in-laws visited, MIL and I would bake a recipe from my class notebook together. She loved it. 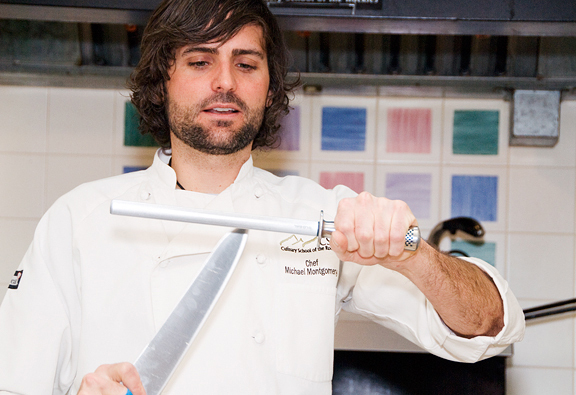 So when my ILs came to visit last year, we all signed up for a class at CSR: knife skills. Hey, it was one of the few classes Jeremy agreed to take because he thought it might help speed up his sous chef skills. That was my first time in the home cook kitchen because the pastry skills course was always held in the professional kitchen and classroom. All of the instructors at CSR are knowledgeable, amiable, and really fun, but my knife skills instructor created quite the hubbub in the comments when I posted about the class. No doubt. If you ever have a look at the CSR home cook calendar, you’ll be hard-pressed to choose just one class that you might want to take. Cupcakes, sushi, Thai, barbecue, gluten-free baking, tapas, breads, pizza, fish, cheesemaking, and the list goes on. They have week-long vacation courses as well as two-day weekend classes, full day, half day, and two-hour classes. But CSR caters to more than just the home cook. In fact, their pride and joy would have to be the graduates from their professional programs: Culinary Arts, Chef Track, and Pastry Arts. CSR invites people to sign up to observe a professional class so you can see if this might be the program for you. 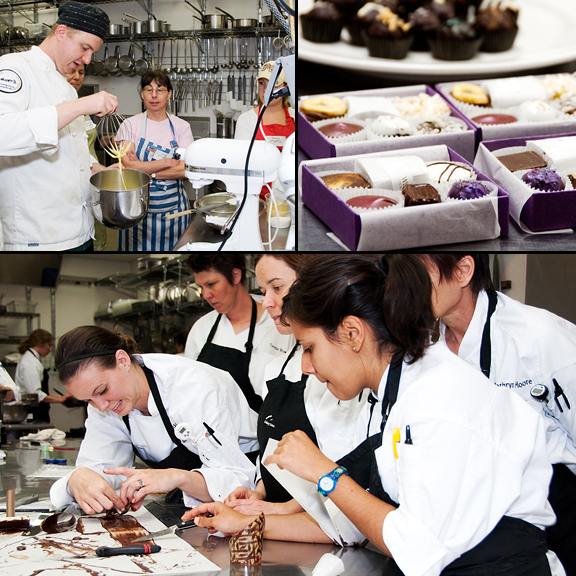 I sat in on a Pastry Arts class the day they covered chocolate tempering and dessert wine pairing. It’s hard work, but it’s fun hard work. What could be better? 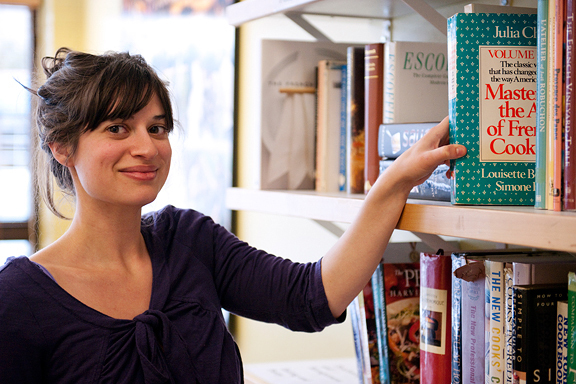 One of the Pastry Arts graduates, Sarah Blecher, now manages the CSR office in addition to maintaining their blogs. We met at Savory Spice Shop for a shoot last fall, exchanged blog addresses and business cards, and Sarah invited me to attend the Culinary Arts Harvest Dinner – the celebratory grande finale of the program’s Farm to Table Externship. How awesome! Awesome doesn’t even begin to describe it. Jeremy and I were seated with some of CSR’s wonderful staff at Harvest Dinner, but I was given special permission to go back into the kitchen (me old stomping grounds from my pastry skills days) to see and photograph the students as they prepped the five-course meal for over 60 people! But what impressed me more than the incredible dishes that were beautifully plated and served, was the question and answer session the students had with the guests after the meal. The dinner is open to the public and diners asked about the Farm to Table program, student experiences, the process of planning an event like this… and the students gave such thoughtful and heartfelt answers. You could tell they learned so much. I didn’t know any of them personally and yet I felt proud of each one of them. Something I admire about CSR that keeps me coming back: they are dedicated to being a part of the community, both locally and globally. When I asked Sarah if they wanted to participate in the Menu for Hope fundraiser last December, she immediately replied with a $100 gift card from CSR. You can find them at the Boulder County Farmer’s Market every Saturday (April to October) preparing dishes and answering questions. I also love their green commitment. They recycle all manner of materials and compost much of the scraps and waste from the classes. And did I mention that they are fun? 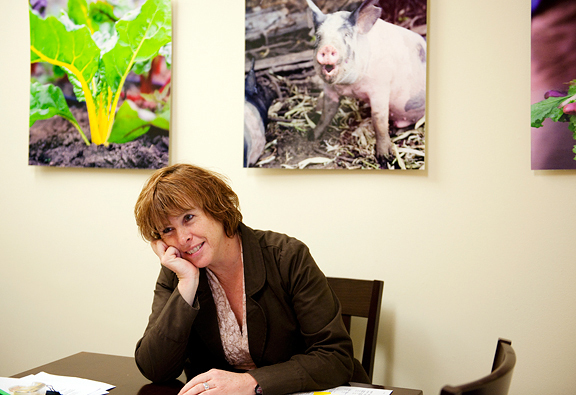 When you walk into the CSR main office, you are greeted with a warm and friendly smile. You can tell they enjoy their work. 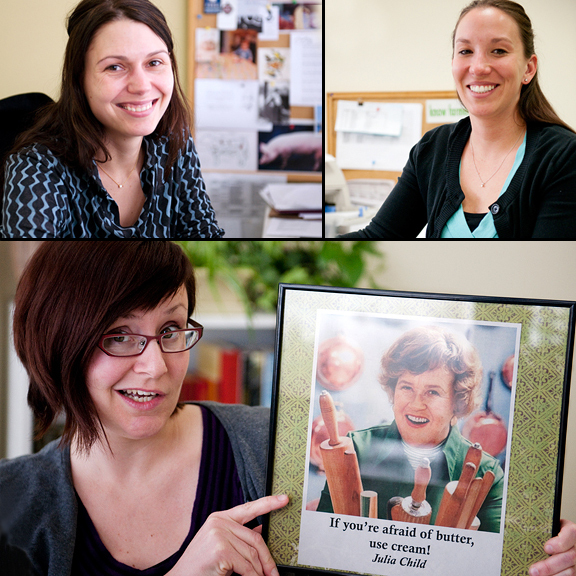 Julia Child’s picture adorns the wall of Sharon’s office. Sophia has a knitted cupcake on her desk. Most of the times I have been in the office, an instructor in chef’s whites will saunter in bearing chocolate-dipped strawberries, or some other lovely confection from the kitchen. I dare you to be unhappy in that environment… I’ll bet you can’t be. The Culinary School of the Rockies is a gem of a institution. I feel fortunate that they are a part of my community. They have something to offer everyone. I know that no matter what I sign up for – a two-hour class or a ten-week course – I’m going to love it. I used to arrive at 5 pm for my pastry skills class feeling low on energy, and by 10:30 pm when we walked out of the front door into the night air, I felt invigorated and inspired (and it wasn’t from all of the sugar, I swear!). If you are looking to change careers, to learn, to have a good time, or to just try something new – give CSR a try. Now I really wish I were taking a trip to Boulder sometime. I’d love to do any of their home cook classes. One technical photography question – in the in-kitchen shots, did you use flash or was there that much ambient lighting available? Great photos! It looks like so much fun! 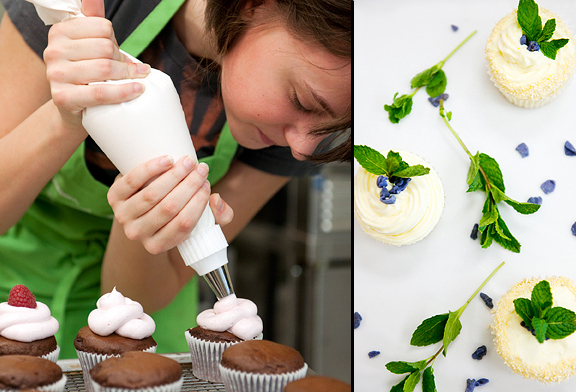 How fun that you took a pastry class at CSR and had such a great time! We’re big fans of the place and have a blurb on our website about it. Our big bias is that Sophia (professional admissions administrator) who’s darling photo you posted up there, is our daughter-in-law. We have been the very lucky recipients of many of Sophia’s pastry creations (she graduated from the professional pastry program there), so I can personally attest to the greatness of the pastry school. I’m just so thrilled that you got to have this experience and that you did such a great post on it. P.S. We love your website too! This post makes me jealous and leaves me wanting to find such a wonderful friendly school I could attend, where I live. Maybe some of the folks coming to Boulder for your Food and Light workshop will consider extending their stay and taking a course at the Culinary School. What a great time that would be! Boulder is a great foodie destination! My wife and I have been talking about taking a class or two together, so CSR has been on the brain. Thanks for the great write-up! Yes. Thank you for the post. I should start looking at their calendar. You must be really love CSR to be dedicating a post to them. And we could tell from your previous posts on CSR too. It must feel good to have something like this in the community! i’m currently in the throes of deciding on if i should go to culinary school. the local school here doesn’t offer the shorter programs you’ve participated in, it’s all or nothing. either i get a degree (or cerficate) or not attend at all. That is exactly what I have been looking for! I’m going to look into finding something similar in my area. Thanks for posting! Merry Jennifer – I did both flash and ambient light shots. The flash light shots look “whiter”. Patrice – that’s wonderful! Sophia (and all of the others) is a complete sweetheart. CSR is one of my favorite businesses in Boulder :) Thanks for dropping by! Janet – that’s not a bad idea :) I wonder if they’ll check it out? Bing – I hope you do. They’re a lot of fun.